Like us on Facebook and get $10 off order of $100 or more (excludes shipping)! Click here to like, then message us so we can reply with coupon code. We ship internationally! View shipping information. The Eternal Bloom Flower is available in jewel tone ruby red, amber yellow, emerald green, cobalt blue and amethyst purple. Handmade in the USA and individually signed by the artist. 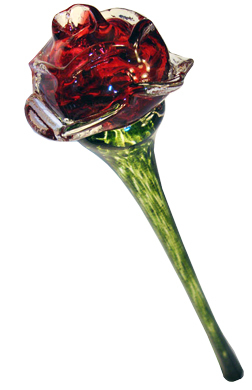 This pet memorial urn is 12" in length with a green stem and your beloved pet's ashes encased in the flower petals. 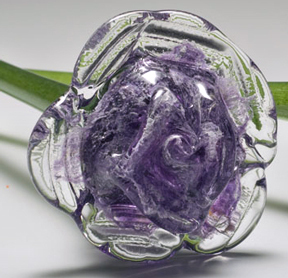 Additional fee applies for etching of up to 20 characters on the stem. After placing the order you will receive a kit to send us a small portion of your beloved pet's ashes/cremains to be encased. The kit will contain a sterile vial labeled with a unique identifier that matches our invoice number. Once the artist receives the kit, they will process each order separately. 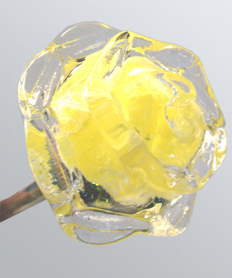 Only one piece of glass is created at a time and the facility is cleaned thoroughly between orders. 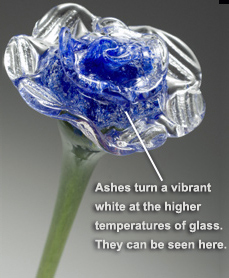 Each memorial comes with a Certificate of Authenticity promiseing the correct ashes/cremains have been used. 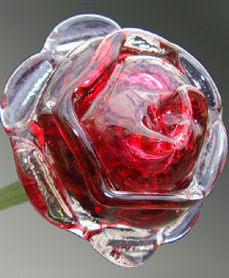 Each glass memorial is handmade and therefore color and shape may vary slightly. After 8-10 weeks the order will be shipped and any unused ashes/cremains will be returned.